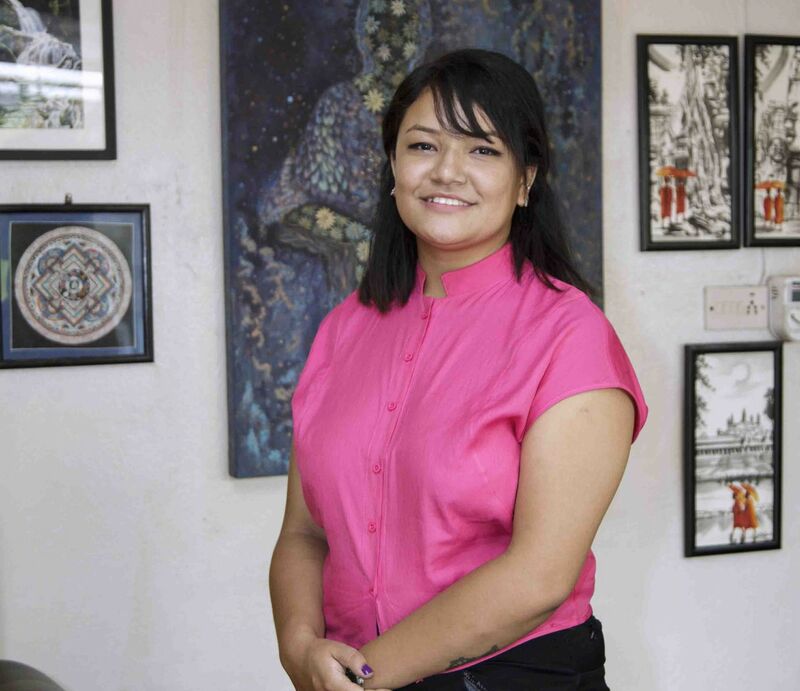 Project Bungamati, an exhibition held at the ground floor of Nepal Art Council, was organized by Kathmandu University showcasing the works of its final year students. 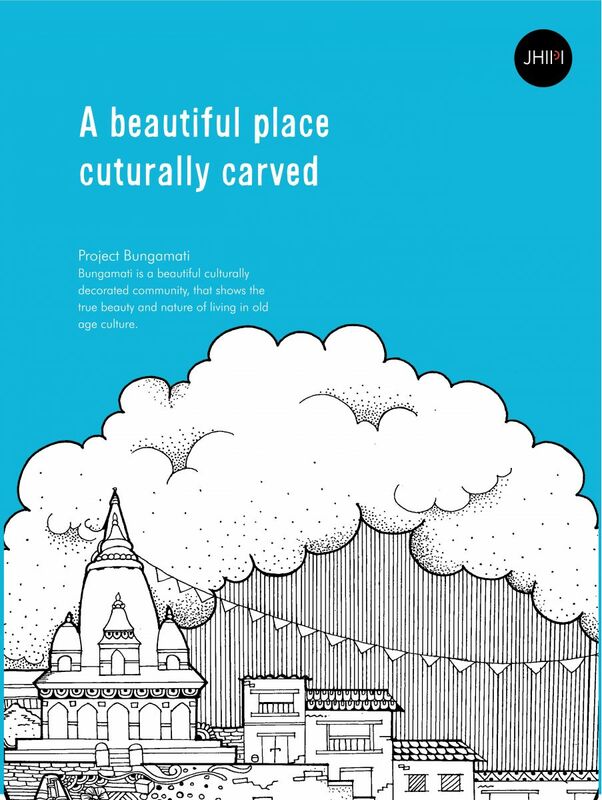 Project Bungamati under the brand ‘Jhipi’ is the brain child of artist Alina Manandhar, and it seems to be a new age representation of this place with a vast cultural and historic importance in order to promote it among the younger generation. Visually appealing shirts, drawing pads, badges, water bottles etc., printed with the illustrations of Bungamati as merchandise captured ones imagination and were a big draw. Alina Manandhar, a graphic designer and a graphic communications student as she likes to call herself, has since childhood been involved in various forms of art. Inspired and taught by her father, Ram Krishna Manandhar, who runs a printing press, she is more into doodles as can be clearly seen in Project Bungamati. She has had some success winning art competitions, drawing logos and flyers from an early age. Project Bungamati’s initial concept started spinning inside her head after the mighty earthquake which devastated the place. The many months she and her friends spent in helping Bungamati’s resettlement in the early days after the earthquake played a decisive role as she came to realize how little she knew about Bungamati even though she had been here several times. Before then, she didn’t even know that Bungamati was the hometown of Machhindranath, the deity who plays a major historical and cultural role in the valley and whose chariot procession is the biggest and longest festival that the people cherish here every year. After realizing her own lack of knowledge, Alina wanted to raise awareness about the cultural importance of Bungamati. After the earthquake, there was this strong urgency of rebuilding not only the infrastructures of this place, but also the lives of the people and their craft. Project Bungamati started out to address in any way it can, to rebuild Bungamati by empowering the local craftsman, especially women and children by developing the skills they already possess and spreading awareness through the art materials the project will produce incorporating Bungamati itself. Looking at the finished products, admiration comes easily, but for Alina it hasn’t been easy. She focused mainly on getting to know and understanding Bungamati so that she could come up with something that trully represents the place, identifying the local craftsmen and teaching them, including women and children, new age skills that the younger generation will appreciate but at the same time, keeping the artistic freedom of the craftsmen intact. Getting the required information and convincing the locals with her project was a struggle. When the municipal officers couldn’t provide a map of Bungamati and didn’t seem bothered, she was disappointed. Hence, the cultural map of Bungamati was the next thing she worked on, visiting the entire territory of Bungamati, pin pointing the places of historical and cultural importance and refining the map that she downloaded from Google. She came up with a set of nine icons representing different parts of Bungamati in keeping with their importance. Eye of the Kumari, Machhindranath’s chariot wheel which later also came out in the form of badges are eye catching icons never seen before. 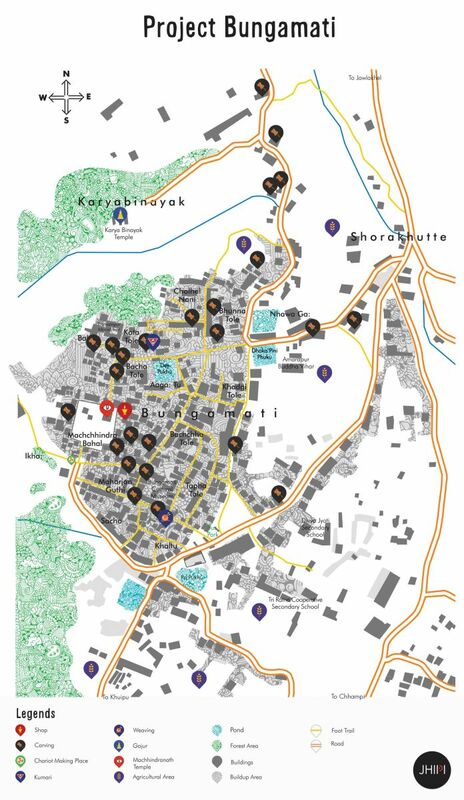 They represent the Kumari home and Machhindra Bahal in this first of its kind cultural map of Bungamati. 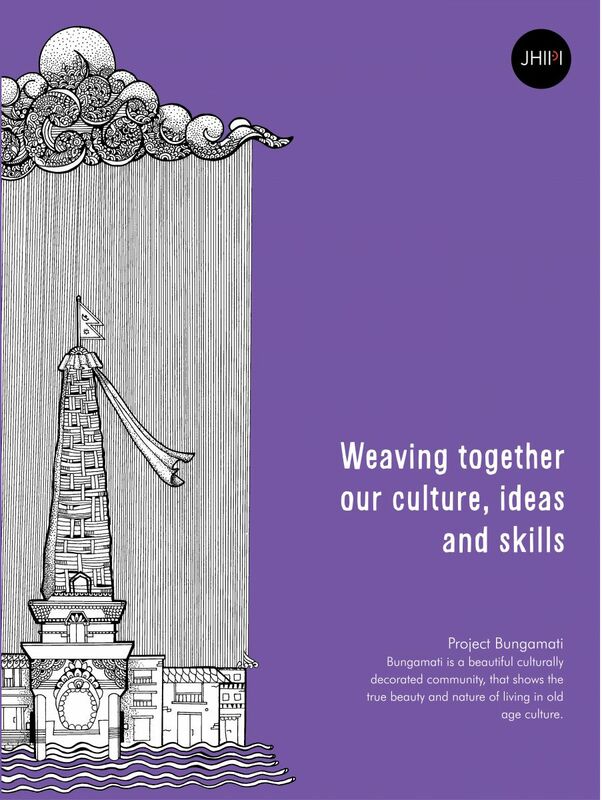 The new cultural map of Bungamati is a major contribution in terms of tourism promotion and documentation of Bungamati. With the help of a friend who hails from Bungamati, Alina met with a local wood craftsmen who then gathered a number of other craftsmen who would work for the project. In the next four months, under Alina’s training and supervision, they produced a number of merchandize ranging from woven cloth, woodcraft, shirts, sketch pads and water bottle prints. As a final touch, Alina also made four master print illustrations representing the whole of Bungamati. The exhibition became a remarkable platform for this project to showcase their achievements. The cultural impact of this project and the contributions it has made in rebuilding Bungamati through skills enhancement is invaluable. Merchandise sold during the exhibition, the satisfying amount of pre-booking they have been receiving at present and the positive feedback Alina received has made the project a success. Alina has plans to do similar kinds of projects in other culturally rich places in the future. Next stop could be anywhere in this historically rich valley with its remarkable craftsman. Hence, ‘Jhipi’, meaning ‘us’, has been used as a brand by the artist herself. The word ‘Jhipi’ could be heard numerous times while working at Bungamati. Alina plans to continue working with the community from Bungamati for at least a year under the brand ‘Jhipi’ collectively for now. Project Bungamati can be an inspiration for growing artists, showcasing what can be done from the community, and for the community. Jhipi is also determined to help artists become entrepreneurs through art in its various forms. Given the continuity of the project for a couple of years, the brand could play a significant role in revenue generation, thus impacting the lives of the community. Even the smallest brand tag in its products, Jhipi signifiess its seriousness and portrays Alina’s skills.